Interview with 2017 Indoor Meet of Champions winner Seth Kricheff. We take a look at the field event returners and highlight some of the top names we'll see this winter. Full rankings that can go 1,000 deep if necessary are available through links next to each event header. For all our 2018 Indoor Preview coverage check out our article series here. The top returner from last indoor season is A'Nan Bridgett of WWPSouth, he hit 6-6 four times last indoor including a second place finish in his Group Championship, at the Meet of Champions, and at Eastern States Championships. While he is the only one over the 6-6 bar returning from last indoors, there were two others who compete during the winter that made 6-6 this past spring. James Bell of West Side finished third at the outdoor Meet of Champions jumping 6-6 and had a 6-6.5 to his name from earlier in the season. Bell is tied for sixth among indoor returners at 6-2. Andrew Colbert of Freehold Township had a big PR last outdoors as well clearing the 6-6 bar at his Group Championship, he is also tied among indoor returners at 6-2. Both of those athletes are juniors this season and were the only non-senior competitors to finish in the top ten during spring MOCs. Jayse Bradley, Kasso Peaks, Davensky Joinvilmar , and Emanuel Montoya all cleared 6-4 last winter as well and will be back on the circuit this year ready to improve and compete for state titles. 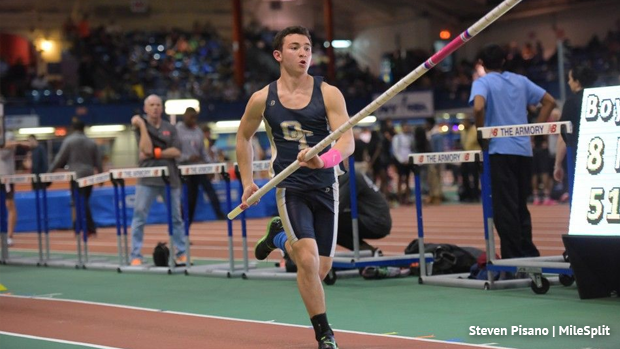 One of only three individual winners at the 2017 Indoor Meet of Champions to return, Seth Kricheff of Old Tappan leads all New Jersey pole vaulters with his height of 14-6. A bar that he successfully vaulted three times last winter and four times during the spring. A well seasoned senior Kricheff has shown consistent improvement year to year and could be New Jersey's best chance at a 15-0+ indoor vaulter for the first time since 2014. Another Old Tappan athlete Luke Annichiarico cleared 15-06 that season leading a group of five boys who all cleared 15-0. The last time we saw a 16+ vault was the season before in 2013 thanks to Craig Hunter's 16-01.25 while finishing fourth at New Balance Nationals. There could be a new face vaulting at the leaderboard as well with sophomore Simon Schenk of Princeton high school. While tied for fifth among indoor returners at 13-0 he went on to have a great freshman outdoor season clearing 14-7 at Central Sectionals, though that is his only vault over 13-06, and qualified for the Meet of Champions where he finished 11th. We'll see if heights over 13-06 is something we might see on a more consistent basis this year. Other athletes to keep in mind at the vaulting pits this season include David Bausmith of Hunterdon Central 14-0, Tyler Hrbek of Old Tappan 13-6, Devin Kusmider 13-6, and Cheney Price 13-0. William Smith also catches our eye, a senior from JFK Iselin he vaulted for the first time last indoor to reach 11-0. During the spring he improved that to 14-1, and with more experience under his belt heading into this season we could see his ceiling reach even higher. Some big names we've been used to seeing atop the leaderboards the past few years have graduated and it is time to crown some new shot put kings. Leading the cream of the crop is C.J. Licata of Gill St. Bernard's School, he is the only returner to throw 60 feet and that goes for the outdoor list as well. Licata finished third at the 2017 Indoor Meet of Champions and second during the Outdoor Championship. The now graduated Jordan West of Rahway won both those events. 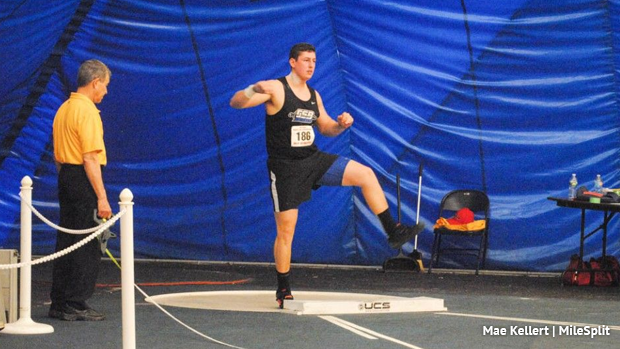 Licata's best indoor mark is 60-0 from his Skyland Conference win last season, he amassed six individual victories during the winter months including a Non-Public B state championship. Joshua Lezin of Lakewood, Dan Mead of Christian Brothers Academy, and Kamron Kobolak of Cinnaminson seem to be Licata's biggest competition when looking over indoor and outdoor lists. Lezin is the second ranked returner from last winter with a 57-3 throw that earned him fifth at the Meet of Champions. Mead and Kobolak had very strong outdoor campaigns. Mead is the fourth returner indoors with a 55-1.5 from his Non-Public A state title, then in the spring during New Balance Nationals Outdoor he exploded for a career best 59-02. Kobolak threw 52-4.75 during a Cherokee Throwdown indoors then won the outdoor NJSIAA Group 2 state title with a mark of 58-1. Also keep an eye out for Nate Raphan of Rumson-Fair Haven, Tarek Elkabbani of Hillsborough, Bill Goldsborough of Delsea, and Brandon Patterson of Union Catholic.